Ecommerce is gaining in popularity all around the world. With more number of existing shops and stores opting to provide their customers the ease of online shopping, the world of online shopping is really heating up. The eCommerce giants continue to attract more customer through their various advertising campaigns as a result of which there are now a very high number people who prefer to shop online. In addition to which this is a trend that is being seen all over the world and amongst people of all age groups and genders. 71% of the customers have their minds made up that they are better of getting a good deal online then in a local store. A whopping 80% of the Internet users have made purchases online. More than 50% of the Internet users have purchased items online more than once. The eCommerce sale in US alone was $304.1 billion in 2015 and this is expected to reach close to $500 billion by the year 218. Mobile internet user are on the rise and have now exceeded those on other platforms. About 13% sales of total UK Economy was from online sales in 2014.This is expected to increase to 15% by 2017. In the online world of eCommerce, payment gateways play an important role in allowing the customers to make purchases online and for the merchants to receive the payment via various channels and into their bank accounts. There are several alternatives to using payment gateways for online shopping and one of them is to use “cash on delivery” option. However there are many downfalls to using ‘COD’ or ‘cash on delivery’. Almost every other option leaves either the customer or the client vulnerable to getting cheated. Hence it is highly advisable to utilize a payment gateway. A payment gateway is essentially an online service that can authorise your credit card payments for e-businesses or retailers online. In addition to which a payment gateway also offers several other options like debit card payment, net banking etc. An ecommerce business can benefit from a payment gateway since it enables them to accept payment in many different methods. Hence a payment gateway is a must for any ecommerce business. However it is not limited to only ecommerce businesses. A payment gateway can be implemented in a website which is selling only one product as well. Besides which a website which has a subscription service for a book, newspaper delivery can also benefit from a payment gateway. Hence if you are planning on selling items or accepting payment online for some or the other service it is a good idea to implement a payment gateway. The payment gateway mechanism prevents fraud and maintains complete and detailed record at every level of the transaction. Most payment gateways will protect the personal and financial details of the customer. For an eCommerce giant that sells to multiple countries, a payment gateway offers the multicurrency payment processing option. Thus this enables the online business to accept payment in many different currencies and improve their flexibility and overall profits. There are two major types of payment gateways in the form of hosted payment gateway and shared payment gateway. Hosted Payment Gateway: A hosted payment gateway will redirect the user to another webpage that is different from the ecommerce website and not even on the same server. One the customer confirms the method of payment and verifies the credentials for the specified amount they will be redirected back to the ecommerce website. 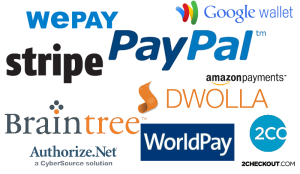 A few examples of as hosted payment gateway service are Paypal, WordPay, Nochex, etc. Shared Payment Gateway: As the name suggests for a shared payment gateway the customer never leaves the ecommerce website. Instead they simply directed to the payment gateway page on the same server. There are a number of options for an online payment processing gateways and at times it gets a bit confusing on which one to pick. Hence there are some key factor to consider. The payment gateway is free for the customer however they do charge the merchant a fee for the service. Hence one of the important elements to consider is the setup fee. There are several other factors to consider though like security of customer information and transactions, the time it takes to process payments, flexibility of currencies and various countries. Additionally it is also necessary to consider transaction rates which includes withdrawal and transfer charges as well as exchange charges. Alakmalak is a leading web development company and have launched a great number of ecommerce websites. Some of these have been developed open source software like Zen Cart, PrestaShop and Magento and others using core PHP. The open source ecommerce solution offer several payment gateway options like PayPal and Google Wallet, etc. while at times the customised solutions require a unique implementations of a payment gateway. Having been in business for over 10 years now and having satisfied over 2006 clients worldwide they are now one of the leading web development firms offering web development services in India and overseas.